The fact that there is an official Dark Tower website should tell you all you need to know about the popularity of the last gunslinger, Roland of Gilead. When he thought up Roland, Stephen King created a hero of such magnitude that, when King was nearly killed in a road accident (1999), many of his fans were as worried The Dark Tower series would never be finished as they were about the fate of the author himself. 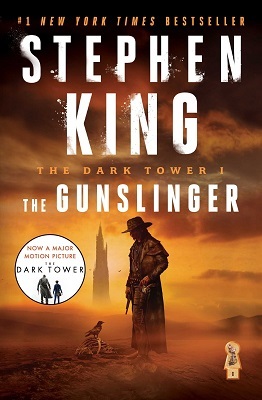 The first Dark Tower book is called The Gunslinger and when the reader meets Roland for the first time he’s crossing a desert, on foot, in pursuit of the elusive Man in Black. Along his way, the gunslinger encounters a dweller, named Brown and his talking pet raven, Zoltan, who greets Roland with a croaky, “Screw you!” Roland also has a romantic interlude with a barmaid named Alice, and befriends a boy called Jake, but The Man in Black is never far from his mind and Roland is ceaseless in his pursuit. I must admit to seeing Roland as a cross between a six-gun-toting-cowboy and a Knight of The Round Table. That’s how I see him; if you decide to read the book yourself you can formulate your own opinion. Needless to say, the book is very well written, and it’s never boring. At 238 pages (my copy, anyway), The Gunslinger is a relatively short book by King’s standards. I read it in just three sittings. Apart from the 238 pages of gun-slinging adventure, the book also contains an introduction and a forward by the author, both of which make interesting reading in themselves. Then, at the end of the book, there is an extract from the second book in the Dark Tower series, The Drawing Of The Three. This adds a further 28 pages to the book. I should also mention there are two versions of The Gunslinger. The book I read was printed in 2003 and had been re-edited by the author. So if you end up reading an earlier version, there may be slight differences in your copy.